“All the Grindelwald via ferrata are closed.” The woman at the tourist information office said these words in a firm, brisk tone that indicated that she didn’t realise that I would find them disappointing. I knew that there was a risk that the long, cold winter might mean that some mountain routes would still be impassable with snow that the hot July sun had not yet melted. I had started to accept that this might be quite a high risk when I had seen snow clinging to slopes and hiding in gullies as I looked out of the train window on the way in to Grindelwald. My trip to the tourist information office in Grindelwald had been done in the hope that I would be told my concerns were unfounded because there was one via ferrata around Grindelwald that I particularly wanted to climb. Not only had the tourist information woman confirmed that I wasn’t wrong, but added that there was also a risk of rock fall. I could have not let this news stop me from trying to climb, as you can’t, strictly speaking, close a cable and a series of ladders running up a mountain. However, I know the importance of listening to local advice about mountain conditions if you want to stay safe and so thanked the woman before walking out dejectedly. My disappointment came from my feeling that I was going to miss a chance to do a via ferrata that would allow me to climb a little bit of the legendary Eiger by a route that is within sight of its iconic Nordwand (North Face). 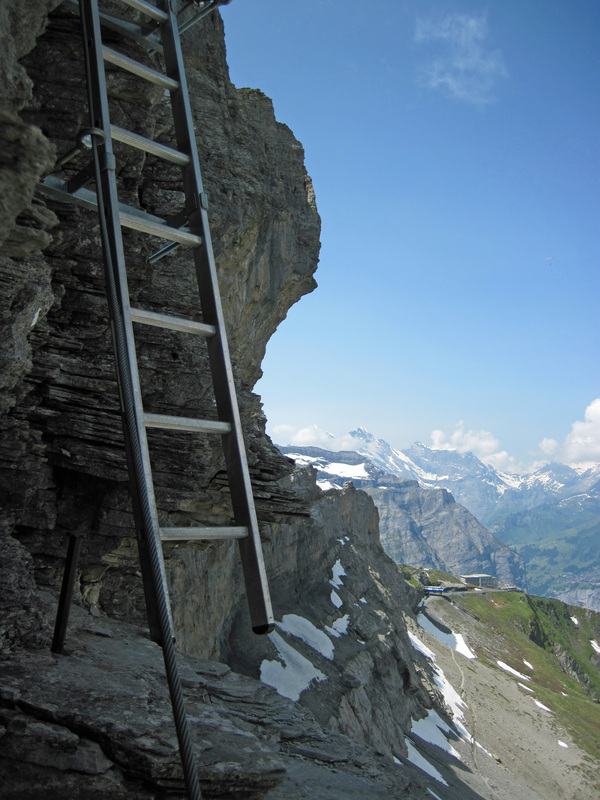 Admittedly, this via ferrata actually goes up a subsidiary peak of the Eiger called the Rotstock, but this simple climb would probably be as close to climbing the challenging and dangerous Eiger Nordwand as someone with my climbing skills would ever get. I’d wanted to climb the Rotstock Via Ferrata ever since I’d heard about a via ferrata on the Eiger a couple of years before. With a baby on the way for Valerie and I, this trip might be my only opportunity to try this route for a few years. But with the Rotstock Via Ferrata off the agenda, I started to think about where to go for a walk. 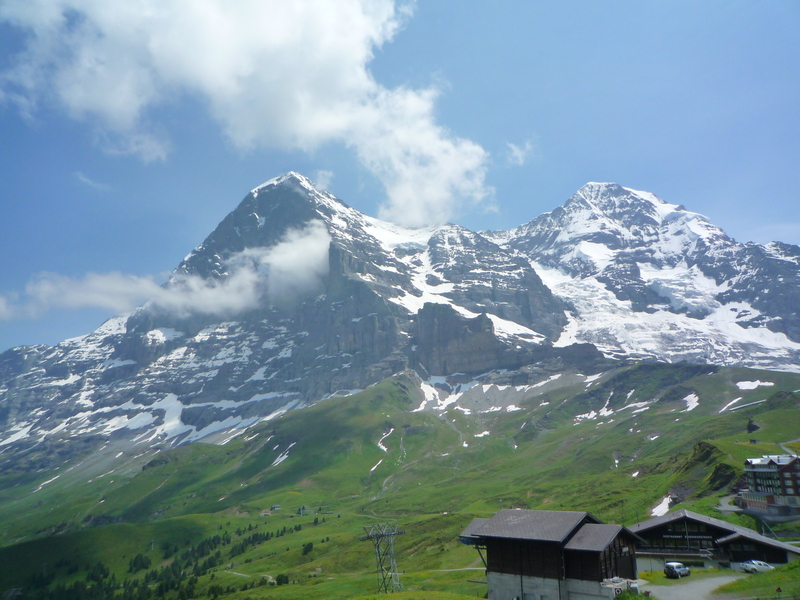 A couple of days later, Valerie and I walked from Mannlichen towards the Eiger. The Eiger looked magnificent, while the Rotstock looked like an insignificant wedge of rock at its side. A vertical cleft separating the Rotstock from its parent peak, breaking what would otherwise have been a continuous crest. I looked at the patches of snow around the Eiger and wished they would melt faster. The Eiger, Rotstock and Monch seen from Kleine Scheidegg. When we reached the tourist and rail hub of Kleine Scheidegg, Valerie pointed out a large board with a map. On one side of this was a list of the walking and skiing routes around the Eiger. Next to the words “Klettersteig Rotstock” (Klettersteig is the German for via ferrata) was a green light. The Rotstock Via Ferrata was now open. The next day was our last full day in Grindelwald and only the second day that year that the Rotstock Via Ferrata had been open. We got up early and rode the railway back up to Kleine Scheidegg. The crowds catching the views and catching the trains of the Jungfraubahn mountain railway were beginning to grow as Valerie and I walked slowly up the ridge to the Eigergletscher Station. The Jungfraubahn is one of Switerland’s most famous attractions. It’s a railway that climbs up and inside the Eiger, through the Monch and out at the Jungfraujoch station perched on a ridge at 3,454m between the Monch and Jungfrau. The views from the Jungfraujoch are supposed to be as amazing as the price of the tickets to get there. Even getting to the first station on the line at Eigergletscher is painfully expensive for such a short ride, so we walked up and drank in the wonderful views. 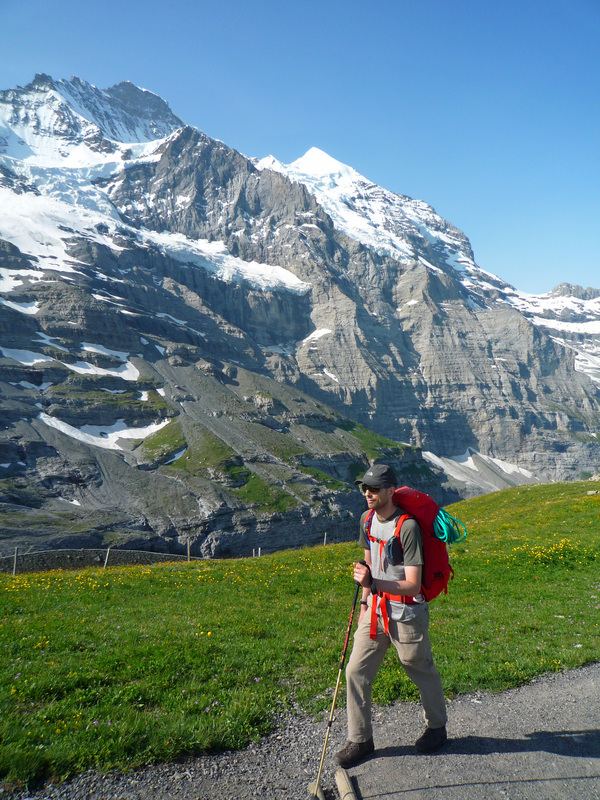 Me walking up to the Eigergletscher Station, with the Jungfrau in the background. From Eigergletscher we walked down the Eiger Trail towards the Nordwand, crossing the odd patch of snow and feeling the chill of being in the shadow of the mountain. 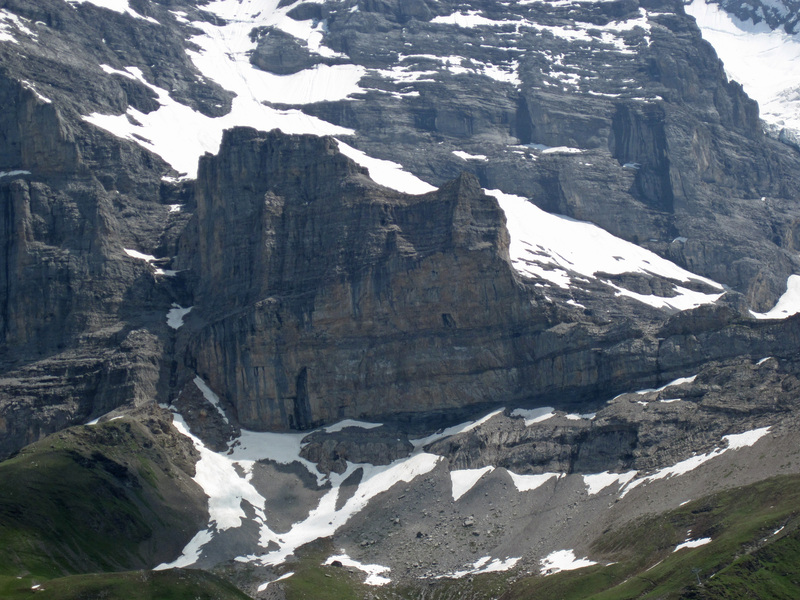 The Rotstock and Eiger Nordwand. Now we were at its foot, the Rotstock had an impressive bulk, with steep cliffs and a mean, huge overhang running across half its face. Thankfully, the via ferrata misses all this. 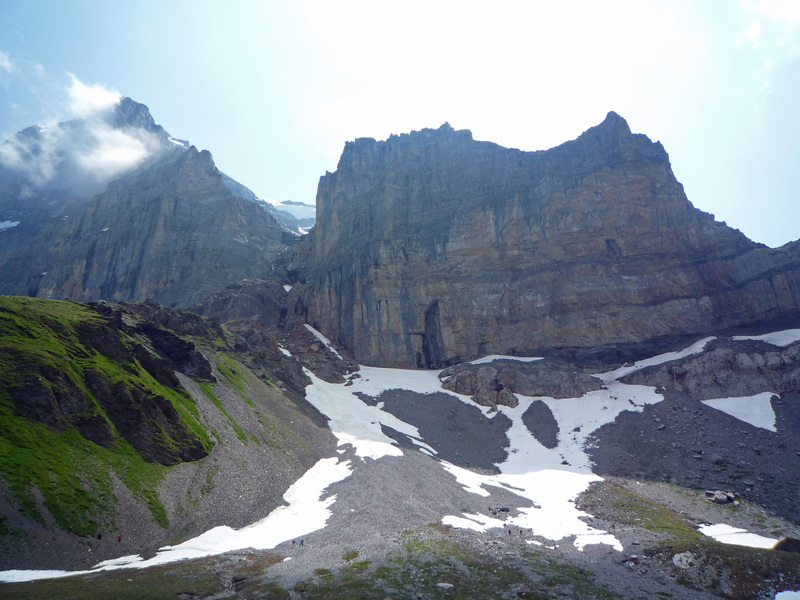 It goes up the buttress and gully to one side of the Rotstock before it climbs around the back of the Rotstock to the saddle (the Rotstocksattel) that sits between it and the Eiger proper. Valerie and I turned off the Eiger Trail at a place inexplicably called Wart to climb a grassy, whale-back ridge to the bottom of this buttress. 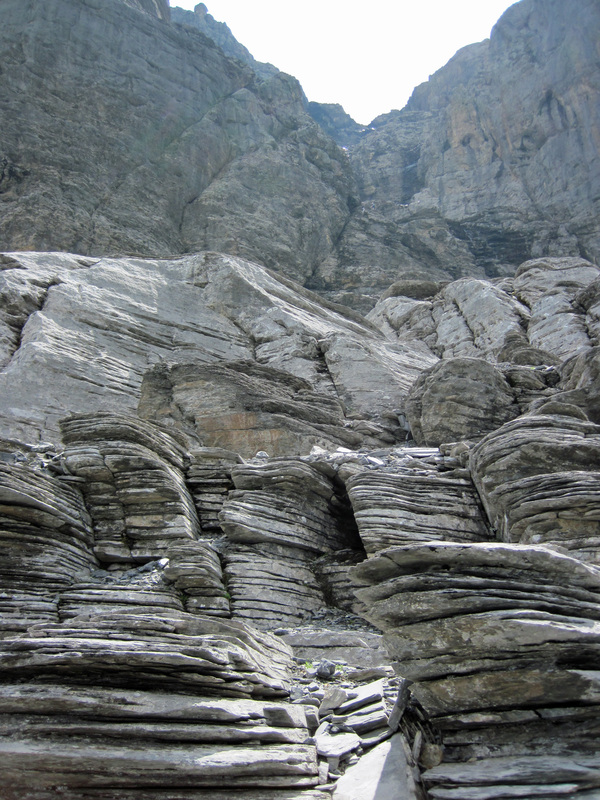 The Eiger Nordwand (left) and the Rotstock. 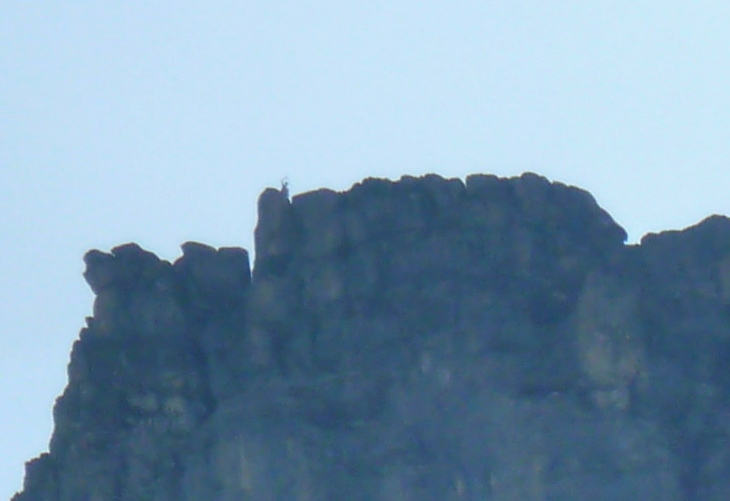 If you look closely, you can see walkers on the Eiger Trail. I was feeling quite excited as I put down my rucksack and began getting myself ready. I was happy to be about to climb, but strangely uneasy and a bit sad that Valerie wouldn’t be able to share this with me. Via ferrata is definitely out when you are pregnant and Valerie was going to watch me climb the first part of the route before getting in place from where she could see me when I got to the summit. 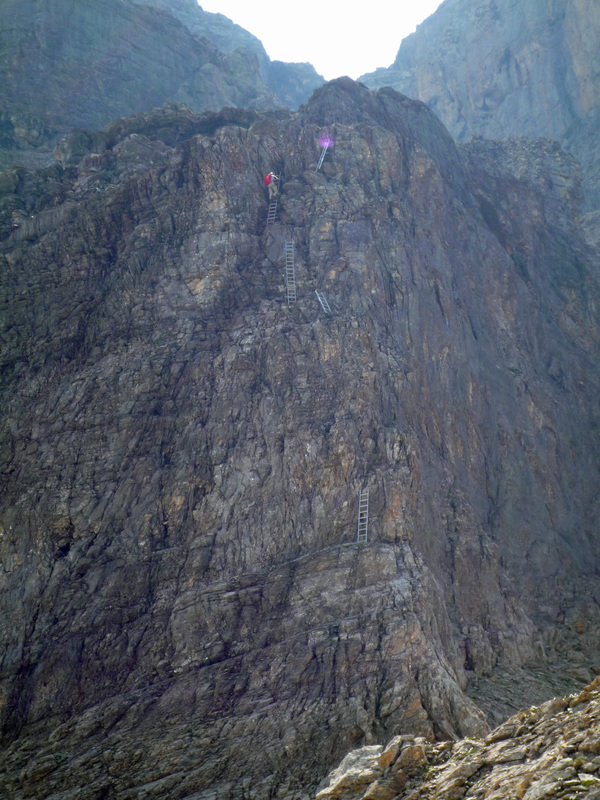 I gave her a hug goodbye and scrambled up to the start of the via ferrata and the first of a series of ladders that switch-backed up the buttress. The ladders wobbled and creaked as I climbed and occasionally looked at the mountains stretching out around me. At the top lip of the buttress I came into the sunshine and stopped to wave at Valerie and look at the dark mass of the Nordwand that was now so close. Me climbing the ladders on the Rotstock Via Ferrata. I then walked and scrambled up neatly stacked or broken pancakes of rock. I was really enjoying moving over the rock, the feeling of being almost wrapped in the mountain and stunning sights of the Alps. An unprotected walk up grey scree took me into the back of the gully and the Rotstock train station. Rocks like stacks of pancakes. Around the turn of the 19th and 20th Centuries, the Jungfraubahn had a station in the Rotstock that was the starting point for tourists to climb along a protected path to the top of the Rotstock to enjoy the view. This path makes up the second half of the via ferrata. It’s the reason why this section has lots of steps cut to take advantage of the natural layering of the rock, some old metal posts for safety ropes and the last, rusty, but seemingly solid, ladder on the route dates from 1899 (according to my guidebook). The station is long closed and sealed up behind metal doors. When I got there a waterfall of melt water was falling between these two doors and an old snow drift was pilled up. Me standing outside the former Rotstock Station. I climbed steps that became more broken up as I moved into a rock scoop at the back of the gully where the cliffs stood tall and framed an amazing view. A large patch of snow sat in this scoop and buried a section of the cable. This was probably why the via ferrata had been closed. 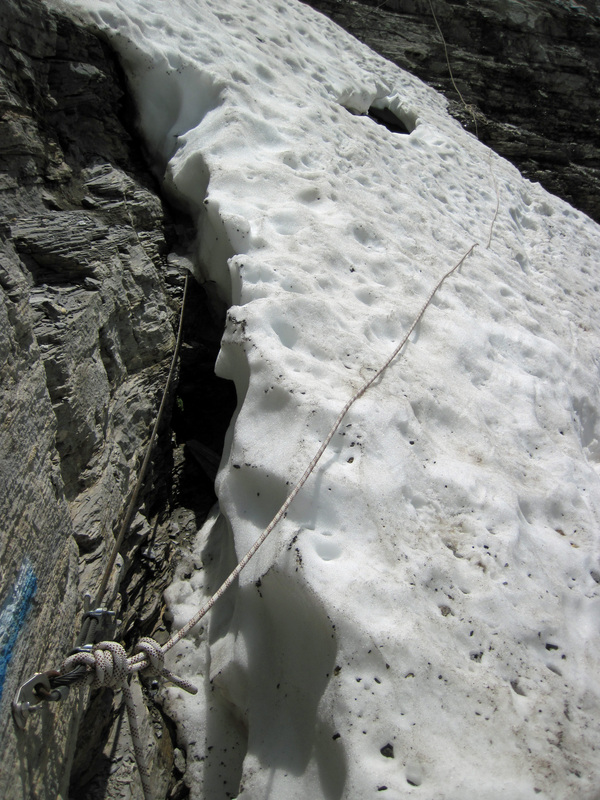 That the snow was only about 10m across near the top and that a rope had been attached over the snow was probably what had allowed the via ferrata to be opened. I happily clipped into the rope and walked across, enjoying the exposure and the chance to do something slightly more adventurous. The buried cable and rope over the snow. The via ferrata then curved and climbed around the other side of the scoop before reaching a ladder in a narrow cleft that led me up to the broad Rotstocksattel. A short walk along the saddle and a short section of mostly protected scrambling and I was on the 2,663m summit of the Rotstock. It had been only an hour of easy climbing and walking. 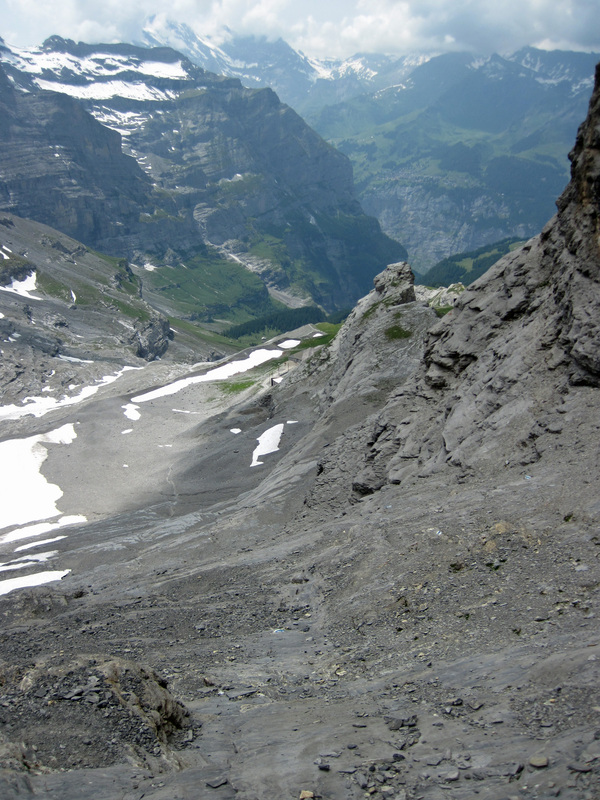 The Rotstock Via Ferrata steps are visible cutting diagonally across the Eiger and into a snow-filled scoop at the back of the gully. I spent nearly an hour on the summit basking in the views and the sun and eating lunch. I just wanted to enjoy the panorama, particularly the relatively close-up views of the west face of the Eiger and of the Monch and Jungfrau. I probably looked like a complete idiot to the other people up there as I waved at the dot 400m below me that was Valerie, but I’m pleased that she saw me. Retracing my steps back to the Rotstocksattel, I started down the back of the Rotstock to the Eigergletscher station. The descent route from the Rotstock. 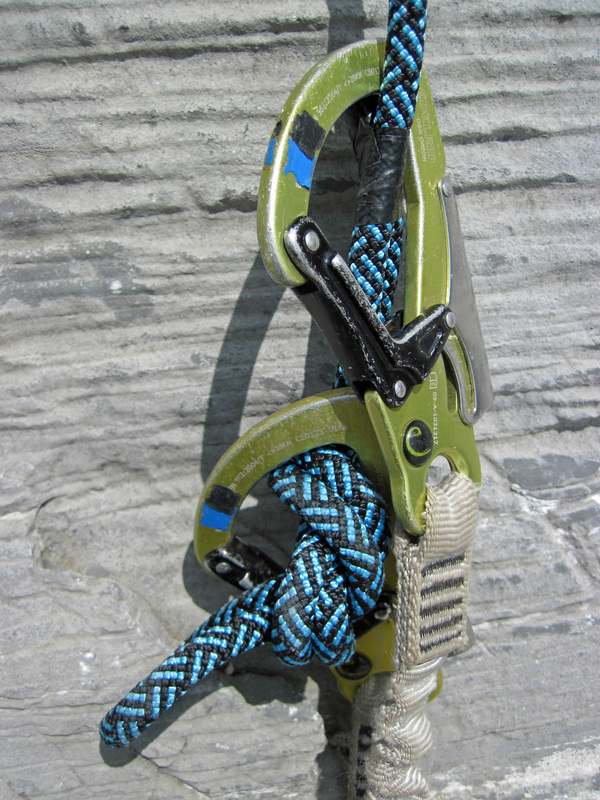 The karabiners of my via ferrata lanyards clipped by the knot at the end of one of the ropes on the descent from the Rotstock. Getting back down from a climb can sometimes feel more risky and difficult than getting up. This was certainly the case with getting off the Rotstock. 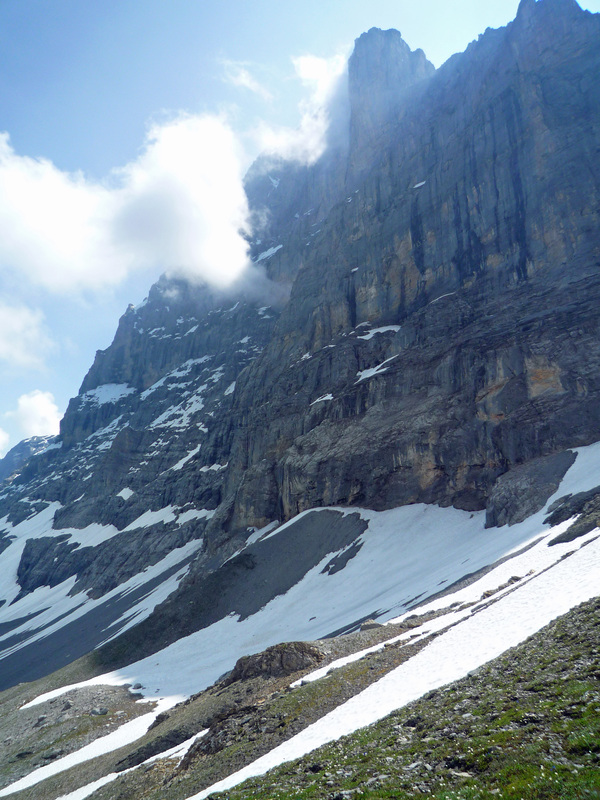 I zigzagged across scree and slabby ledges as I followed the white and blue paint marks that marked the path. Apart from trying to avoid the odd patch of snow, I had to take care that the bits of rock strewn over the ledges didn’t act like ball bearings under my feet, sweeping them out from under me and sending me bouncing down the mountain. Some of the steps between the rock ledges were also quite tall and I had to take care finding holds. Ropes had been fixed across some of the trickier sections. I initially clipped my lanyards on to these to catch me if I fell, but stopped doing so when I realised that most of these ropes were only connected to the mountain at the top and ended with a knot that would easily pass through my karabiners. Instead, I down climbed some of the ropes. 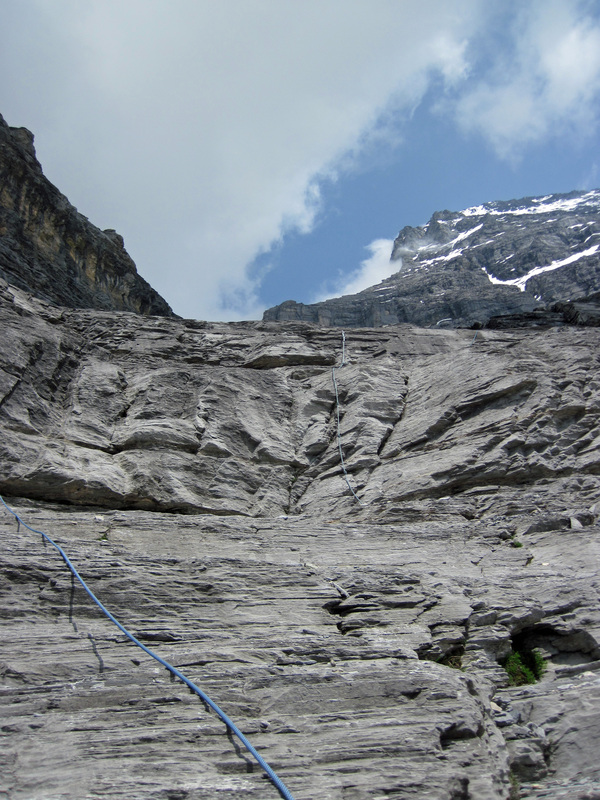 The descent route from the Rotstock, with some of the fixed ropes and the west face of the Eiger. Partly because of these slight challenges and partly because I was enjoying the odd glance at the glaciers around the Monch and ridges of the Jungfrau, I was having a really good time. I was about two-thirds of the way down when I met two climbers who stopped me with a hopeful “klettersteig?” and pointed fingers up the way I had just come. They were surprisingly not that annoyed when I told them that they were on the wrong side of the mountain and showed them where to go on the map. People zigzagging across the mountain as they descend from the Rotstock. After this I picked up the pace to make sure I wouldn’t be too late for meeting Valerie. I met her at Eigergletscher station and celebrated having done a fun little via ferrata, and a little bit of the Eiger, with a big eis cafe. The English language guidebook that describes the Rotstock Via Ferrata is Via Ferrata Switzerland by Iris Kurschner and published by Rother in 2005. This includes a description of the route and a simple map. The SummitPost website has a good, detailed description of the Rotstock Via Ferrata together with lots of useful photos, including photos with the ascent and descent routes marked on them. There is also a summary of the Rotstock Via Ferrata on the website of Switzerland Tourism. 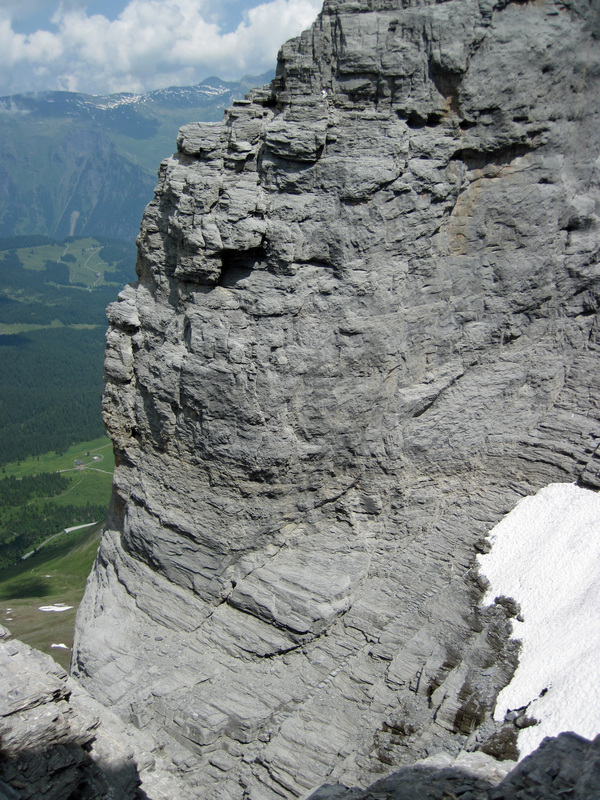 If you don’t have any experience of via ferrata and want to give the Rotstock Via Ferrata a go, Grindelwald Sports runs a via ferrata taster course in which a mountain guide will take you up this route. A fascinating story with lots of useful information and great photos. I’m sure you enjoyed it very much and that the trip to Switzerland was worthwhile. Thank you. It was a great trip and we both really enjoyed it. Hopefully we will get to go back soon and show junior some mountains and glaciers (although it’ll be a few years before he gets to do a via ferrata). I have read this article with genuine interest,very suggestive photos of the notorious Eiger Nordwand with its black ice,rotten rock and the more accessible Mittellegigrat. I’m pleased that you liked it. It was cool seeing the Eiger Nordwand, particularly so close to the 75th anniversary of the first ascent. Wow, I had no idea this kind of thing was available in the Bernese Alps. Looks like a fantastic experience! I have never been climbing, very envious of people like yourself who can get these unique views that few people experience. If you ever want to give it a go, then you can always hire an IFMGA certified mountain guide to take you up something and show you some of the skills required. It might be a little expensive, but it would be a good foundation and the views would probably be stunning. At the start of June 2012 I too wanted to climb the Rotstock. I asked whether it was open in Grindelwald, but they were unsure, and I didn’t see the sign in Kleine Scheidegg. Perhaps that was a good thing. According to the summit log book it seems I made the second ascent for 2012! The walk across the snow field at the bottom should have been a hint, but the rock seemed clear. Unfortunately, where you found the cable buried under the snow, so did I but without another rope over the top. Kicking steps across the 30m or so of the snow slope unprotected was certainly “exciting”! After the summit, the challenges only increased as the descent route was almost completely buried in snow! The round trip took around 5 hours instead of maybe half that! Still one of the highlights of my trip though! Damm, going over that snow slope must have been exciting – it would have been one hell of a slide if you had slipped! It can’t have been a relaxed descent either; I remember it being quite steep in places. The route and Eiger must have been an amazing sight in the snow. Did you manage to get some photos? I don’t have many photos (did I mention not having a climbing partner?) but here’s a few of the Rotstock, and also of Zermatt’s Schweifine via ferrata that I did a few days earlier (my first via ferrata). The second directory has the original large photos. It’s just files so sorry, no slide show software. The snow slope could have been worse (although I was very … focussed … while crossing it), but as you can see the weather was great and the snow was reasonably soft. Not having much Alpine experience, to be honest I was more concerned about the possibility of a “slab avalanche”! If you look at the photo of the snow slope section (especially in the large file), you can just see my steps leading down from the top left from where I thought I might be able to cross on the rock at the top. There’s a photo of part of the descent (taken from the station before I started) showing the snow cover. Fortunately the top and the roped parts were mostly snow free. I stayed out fairly wide in the snow with the idea I was less likely to find a sudden drop. I finally saw some other people coming up (sound familiar?) which gave me a hint as to where I should have been for the rest of the descent. Again rather like you, my wife was waiting patiently (for the first few hours anyway!) at the Eigergletscher station. I do like the way you can get phone reception so that you can let your partner know you’re still alive! The day was made more stressful by not having any form of snow equipment, not even a walking pole. Fortunately the rest of my gear, and 40 years of rock climbing experience, made the day more a calculated risk rather than sheer stupidity. We are hoping to return to Switzerland in late August 2015, and I plan (hope!) to repeat the Rotstock via ferrata in more reasonable conditions! BTW, I forgot to compliment you on the original post. Nice story-telling, and I didn’t know the history about the earliest Rotstock path for tourists! It makes more sense now about the carved steps, etc. Thanks for the photos. They’re great. It looks like you had a lot more snow than me to contend with and I’d have been very focused too, particularly without crampons and an ice axe. It seems like you had a good adventure though and a fun one to repeat when there is less snow. I may well repeat it myself at some point as my wife was a bit jealous that I got to climb it and so I’m happily committed to a second ascent. I’m glad that you liked the post and thank you for the compliments on the story-telling. A belated reply to tell you that I did indeed return in August 2015. Unsurprisingly there was no snow on the Rotstock, but I was mystified to see the via ferrata was still closed. I thought the electronic sign was broken so I continued on. A sign at the base said the route was closed due to avalanche threat on the descent! Mentally I was already committed so I (and many others!) continued on. 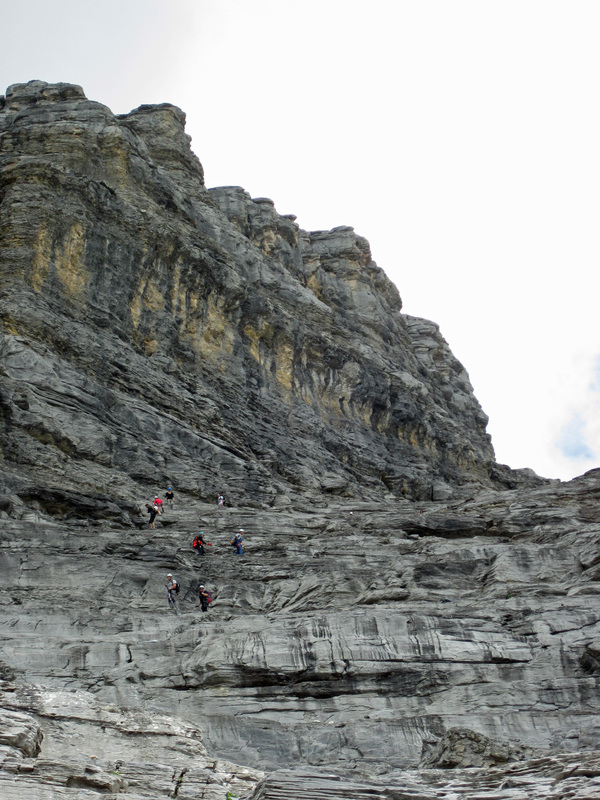 The descent was far easier without snow, but we did indeed see avalanches coming down from the main part of the Eiger. Fortunately we seemed to be far enough to the other side to be OK. I climbed several other Swiss via ferratas as well, including the Murren-Gimmelwald one that you’ve mentioned (steel staples that move as you lean out over a huge drop are unnerving!) and another that I highly recommend, the Kandersteig via ferrata. It has an amazing ladder past an overhang that twists through 180 degrees so that you start on the inside and end on the outside! Well worth the effort to get to! Note that while it’s not super hard, it’s definitely harder than the Rotstock, and maybe the Murren-Gimmelwald (certainly it’s much longer, and it ascends all the way). It’s great to know that you got up the Rotstock again and that you didn’t need to cross any snow slopes this time. I’ve had temples wobble on me as I held on to them and I agree that it’s unnerving (although I think I’ve other words at the time). Thankfully, I’ve never known one to actually come out of the rock. The Kandersteig via ferrata sounds fun (if a lot of effort) and I’ll see if I can get a chance to do it the next time I’m in Switzerland. Thanks for taking the time to write about your adventures. Thanks for detailing this via Ferrata. Your post gave me the type of info I needed. Without your pictures and descriptions, I think I would have been questioning if I were going the correct way especially the descent as we were the only ones on the mountain that day. My 13 year old and I had a great time – although he repeatedly stated how much he hated me on the ascent. His reaction at the top, however was “this is spectacular”! I can’t wait to do it again. That level of difficulty is about perfect for me and I like not having to descend in the same direction. While we are able to live in this beautiful country, I look forward to exploring more. Do you have any other klettersteigs in switzerland that you would recommend of similar length and difficulty? Thanks. I’m really pleased that you liked the post and that it was so useful. To be honest, I’ve only climbed two via ferrata / klettersteigs in Switzerland – the Rotstock and the Murren-Gimmelwald Via Ferrata. The Murren-Gimmelwald Via Ferrata is fantastic, but a notable step-up from the Rotstock in terms of difficulty. Most of the via ferrata I’ve climbed have been in Italy and so I’m afraid that I’m not really able to make many recommendations for Switzerland. 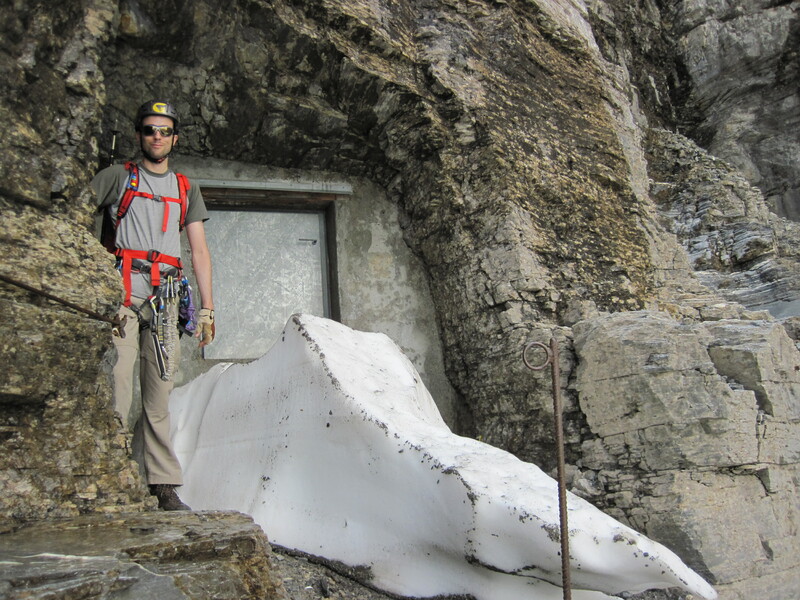 Thankfully, there are a few sources of information on Swiss via ferrata. In addition to the information sources I’ve mentioned above, there are some other websites that you will find on the useful links page. Thank you for this- really helpful – looking to start climbing (as much as I can do now at my age) and had no idea of these routes. I’m glad that you found it helpful. Have fun climbing. I’m happy for you to link to my blog (as long as my blog is credited / referenced). I’d love to read what you thought of the climb, so please send me a link to your post when it is up so that I can have a read. Thanks for sharing this! I’m going to Interlaken mountaineering later in the year and this sounds like something we should definitely do!! Glad you liked the post. It’s great and worthwhile doing. I’d be interested to hear how you found the climb.